It’s sweltering and you have a hankering for a seasonal sweet like pumpkin bread. What do you do? 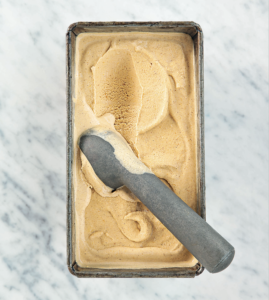 Well, if you’re us, then you whip up a batch of Spiced Pumpkin Ice Cream, which has all the great flavor of a Pumpkin Spice Latté but is a little more seasonally appropriate! In a saucepan, combine 11 ⁄2 cups (12 oz/375 ml) of the cream, the brown sugar, and molasses and stir to blend. In a bowl, whisk together the egg yolks, cinnamon, nutmeg, ginger, and the remaining 1 ⁄2 cup (4 oz/125 ml) cream until well blended. Place the saucepan over medium heat and cook, stirring frequently with a wooden spoon, until bubbles form around the edges and the sugar dissolves, 4–5 minutes. Do not allow to come to a boil. Remove from the heat. Whisk the egg yolk mixture while slowly pouring in the hot milk mixture. When almost all of the hot liquid has been added, slowly pour the warmed yolk mixture back into the saucepan, still whisking. Place the saucepan over medium heat and cook, stirring constantly, until the custard is thick enough to coat the back of a spoon, 4–5 minutes. Do not boil. Pour the hot custard through a sieve into a clean bowl, gently pressing the liquid through the sieve and leaving any grainy solids in the sieve. Stir in the pumpkin purée and vanilla until blended. Place the bowl with the custard over an ice bath and let cool for 30–45 minutes. Place a piece of plastic wrap directly onto the surface of the custard and on top of the bowl. Refrigerate for 3–24 hours. Prepare an ice cream maker with at least a 1-qt (1-l) capacity according to the manufacturer’s directions. Pour the custard into the ice cream maker and churn until the custard reaches the consistency of thick whipped cream. Transfer to a plastic freezer container, cover tightly, and freeze until firm, at least 3 hours or up to 3 days. 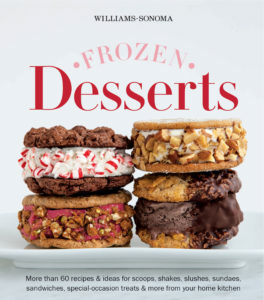 For more warm-weather treats, check out Frozen Desserts on Amazon.